Today Amazon starts the third annual Prime Day promo. Through July 11, 2017, there are hundreds of thousands of items featured on this year’s exclusive promotional event for Amazon Prime members. 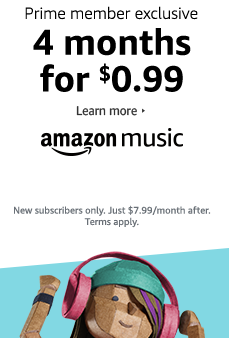 The first promo leading up to July 11 Prime Day is at $0.99 on subscription of 4 months Amazon Music Unlimited. Valid from 12:01 am June 29, 2017 through 11:59 pm July 11, 2017, new Music Unlimited subscribers with Amazon Prime Member will receive the promotional offer of 4 months subscription for just a total of $0.99. Customer who redeems the Prime Day $0.99 promo will receive an e-mail from Amazon for the instruction on how to activate the promo credit. Offer limited to one per Amazon account and customer. Click to save on the first Prime Day promo at $0.99 on subscription of 4 months Amazon Music Unlimited right now >>> In addition to Prime Day 2017, you can visit the official Prime Day page where Amazon Prime Member will find surging promotions exclusively every day, and till at 6pm / 9pm on Monday, July 10, 2017 – with big deals as often as every five minutes.